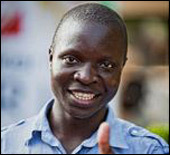 My name is William Kamkwamba. I am 19 years old. I live in Mastala Village in the area of T/A Wimbe in the Kasungu district of Malawi, about 2 1/2 hours north of Lilongwe, Malawi's capital city. Over the next few weeks, I will try to communicate the journey I have taken over the last several years. One note: My native language is Chichewa, the indigenous language of Malawi. The country's official language is English, and my English comprehension is good. I can speak pretty well, too, and write, but I'm a bit out of practice, so a friend of mine is helping with the writing and editing of this blog. 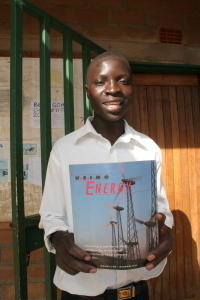 At home I live with my family, parents Agnes and Trywell Kamkwamba and four of my six sisters. I'm second among the seven children: my older sister is married and has two children and lives away from our home. My next younger sister is away part of the year at school. After my primary education, I was accepted at and began secondary education in Malawi. I began first form (equivalent to a high school freshman in America) and took two trimesters out of three. After the second trimester, I was forced to drop out of school because my family and I did not have enough money to pay the school fees. I was out of school for five years. 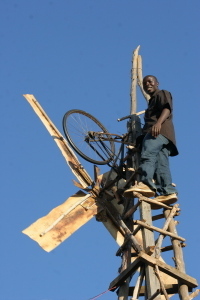 I built my first windmill when I was 15. Over the next few years I kept refining the design. I made many modifications to the plans i found in the book. For example, I increased the blades from three to four to provide more power output. The windmill now powers lights for 3 rooms and a light over our porch outside. I also use it to power my family's two radios. I also can charge mobile phones that the neighbors have. In November of 2006, the deputy director of the MTTA, Dr. Hartford Mchazime found out about me while visiting the library where his organization had sent the books. He asked to visit me at my home to see the windmill. He asked me many questions about how I had built it. I will explain in detail in my next message. 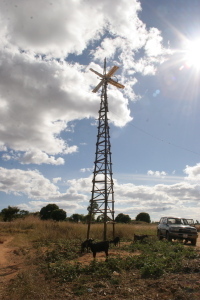 Dr. Mchazime brought several journalists to see the windmill, among them Sangwani Mwafulirwa, reporter for The Daily Times, one of Malawi's largest newspapers. As a result of the publicity, Dr. Mchazime was able to raise enough money to send me back to secondary school. I've been enrolled for a trimester at a boarding school about an hour from my home on the way to Lilongwe. Unbeknownst to me until about two weeks ago, Soyapi Mumba, a software engineer based in Lilongwe brought the article to the attention of Mike McKay, his colleague who writes a blog called Hactivate, and Mike posted on his blog about the story in the newspaper. I found out recently that several other people also wrote about my story on their blogs, too. Two weeks ago I used a computer for the first time. I learned about Google and searched for "windmill" and "solar energy." I was amazed to learn how many entries there were for both subjects. My friends showed me how to create an email address and now I am on Gmail. Now I am practicing sending and receiving emails when I have access to a computer. I don't have regular access to a computer yet, but I'm working on a way to get online more easily. 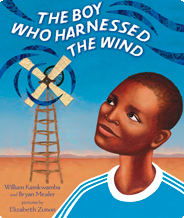 You can write me at williamkamkwamba at g mail dot com.